In 1764, Charles-Marie Bonaparte wed the young Letizia Ramolino and settled with her in the Bonaparte family residence. Napoleon was born there on August 15, 1769, and Lucien, Louis, Jerome, Elisa, Pauline and Caroline followed. After three years spent on the continent from 1793 to 1796 due to the family's allegiance with the French Republic, Letizia returned to Ajaccio in 1797 and had the house both improved and enlarged. Napoleon spent a few days there on returning from Egypt in 1799. He was destined never to set foot again in Corsica. In 1805, he handed the house over to his cousin André Ramolino. It was eventually reclaimed by Napoleon's mother in 1832 and passed on to Joseph in 1843. In 1852, Zenaïde, Joseph's daughter, donated it to her cousin Louis-Napoleon, soon to become Emperor. Napoleon III, and Eugénie had the house both refurbished and enlarged, and the Empress opened it with the imperial Prince by her side in 1869 for the hundredth anniversary of Napoleon's birth. The house then became the property of Prince Victor-Napoleon, Jerome's grandson, was donated to the State in 1923, and became a national museum in 1967. 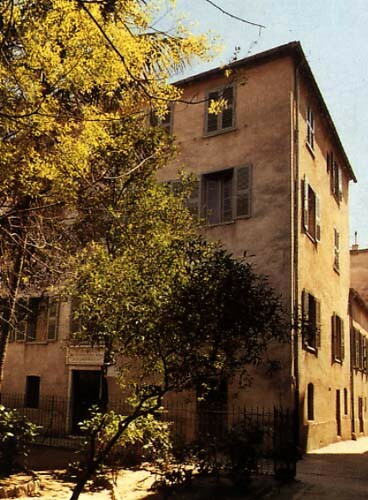 Napoleon's birthplace, a large and simple residence, is now a museum devoted to the Bonaparte family in Corsica. The visit starts on the second floor with a historical evocation of Corsica in the 18th century, and is followed by an introduction to members of the family: Charles and Letizia in the first room, Napoleon, his brothers and sisters in the second room. Visitors are then led into the “Chambre de l'Alcôve” which is thought to have been Napoleon's room on returning from Egypt. Another room is devoted to the family's history during the Second Empire and recalls Napoleon III and Eugénie's travels. The ground floor and the cellar feature a few photographs of the family residences around Ajaccio and photographs of various agricultural instruments used on the land such as millstones, jars and oil-presses. Accessible to people with limited mobility. Open every day except Mondays, Christmas Day (25/12) and New Year’s Day (1/01).